Rotary Foundation . . . Thanks . . .
Posted by Gerald Walker, Esq. Thanks for your support to the Rotary Foundation . . .
A picture of our own Lou Falk enjoying St. Maarten! 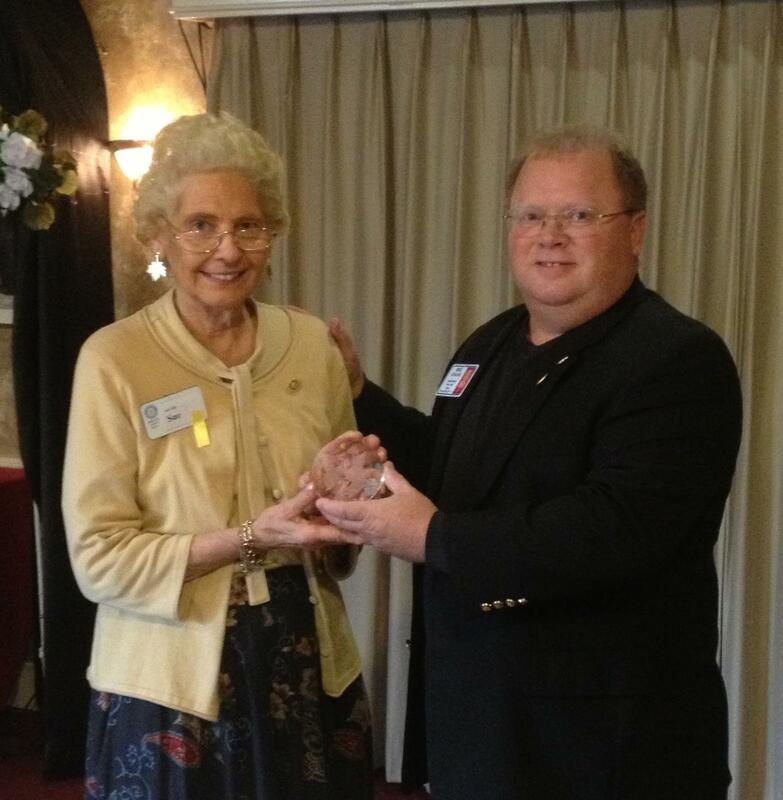 Mike Scruggs presents the Major Donors Award from Rotary International to Sue Ellis in honor of Tom Ellis' long and significant support of Rotary International's Foundation. Ron Boetker, IT professional from the Willoughby Club, was a guest of Patrick Armstrong. Welcome, Ron, it was great to have you with us! Anita passed around the sign-up sheets for upcoming shows. Please let Anita know as soon as possible if you can attend so she can give ticket counts to the schools. Sue announced two Easter programs being held at the YMCA for children and families: Sunday, March 13 is Journey to the Cross, and on Good Friday there is a breakfast and program. Breakfast begins at 7:15 and the program will conclude by 9:00. Stu Lucker gave a buck in honor of Dr. Lucker being off IVs, and in honor of the beautiful weather. Ann Radcliffe gave a happy buck because her Leadership Lake County group won Best in Show at the Home Expo last weekend for their display. Patrick Armstrong gave a sad buck because of the weather - it was the reason his ski trip was canceled last weekend! Ann won the drawing of $15; the Queen lives, and is up to $100. There were no birthdays at this meeting. Our Newest Paul Harris Fellow: Sue Ellis !!! Where to find Drama Awards Scoring Sheets . . . Welcome New Member: Judy Emery! 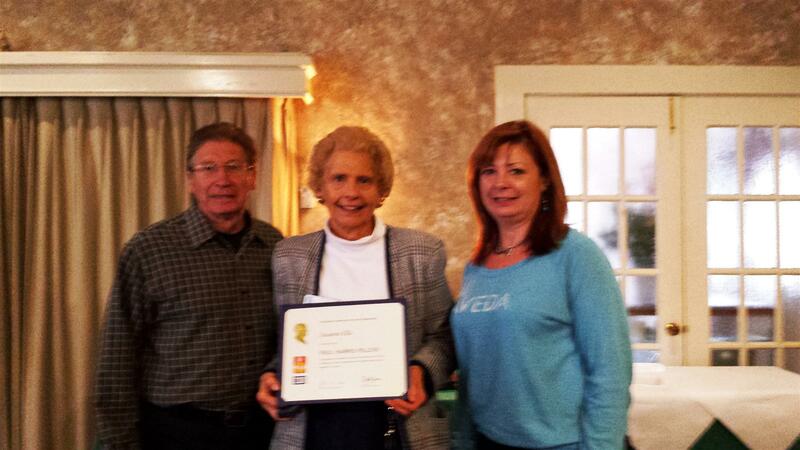 Welcome our newest Painesville Rotarian: Judy Emery! If you need help using our program Clubrunner, our website, or just need help getting logged in, then call or email Brad Brown at (440) 510-8122 or brad@RoyalPaladinGroup.com. Today's meeting was about the Reverse Raffle. We are in great shape in terms of prizes, auction items, and activity for the event itself. Still push ticket sales, though, as the key to a great event is having a lot of people there. Brad reviewed the list of on-site jobs and who is responsible for them, Abby reviewed the plans for the night of the event (arrive at 5:30 for final set-up so everything is ready to go at 6:00), and various lists were passed around for proofreading before they go to print (e.g., auction item donors). Does our System Really Need a Password? With Identity Theft and "data mining" on the internet such a problem, it is best if we keep your name, home address, phone numbers, including cell numbers, and other personal information safe from those surfing the internet for information. However, your trusted fellow Painesville Rotarians might want to contact you or check on the name of your spouse they just can't seem to remember now. So with a password they can easily find those things out. We are just trying to find the balance between easy information for you and hard to get information from those you don't want to have your personal information. P.S. 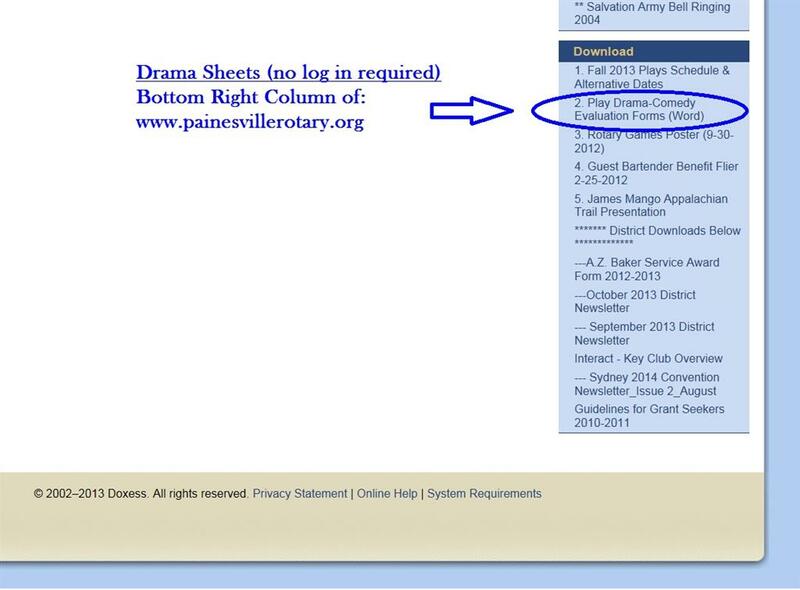 You can get and print a listing of all Rotarians and their contact info anytime you want (and you know it is updated to the latest we have), but sorry you can't forward a contact list from the bottom of the eBulletin (and therefore can't have it forwarded all over the internet). Rotary Park (formerly called North Park) was renamed in 1996 after the local Painesville Rotary Club donated thousands of dollars and many hours of labor to revitalize and renovate this small neighborhood park. The park offers a ball diamond that is used by several youth leagues for practices. It also has a new play structure purchased with funds from the state Natureworks grant program. This 4 1/2 acre park is located off Hine Avenue.